Trump can't be banned from Twitter, but then he shouldn't be able to block me, either. 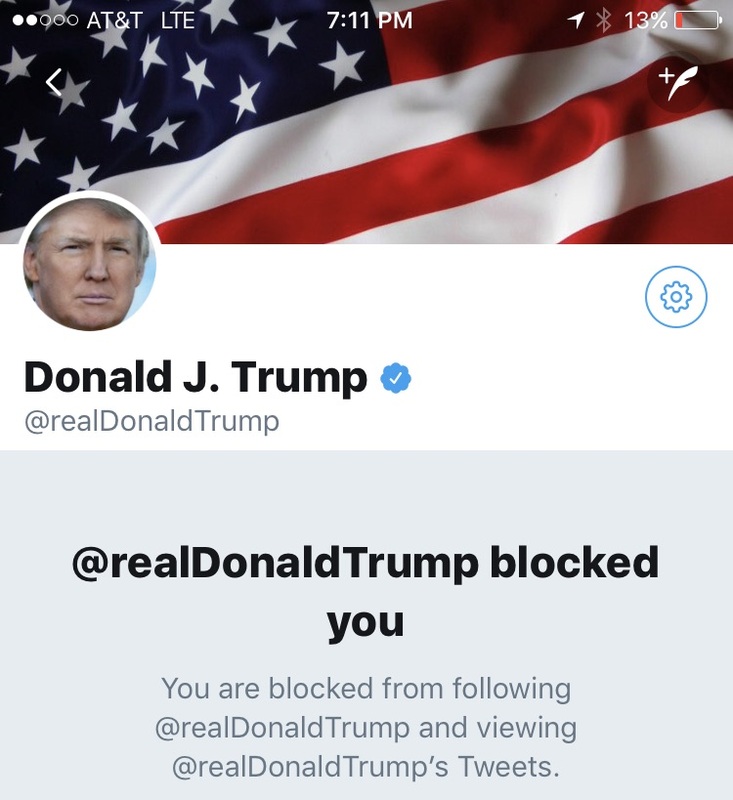 As you may know, the President has blocked me on Twitter. Shortly after I fired off three successive tweets at him this summer about his failure to produce his promised tax returns, Trump tweeted some inane nonsense to the world and then blocked three people (likely the three at the top of his feed), including me. I was outraged. I remain outraged. Yes, I can still see his tweets via an alternate account or a variety of browser settings, but I am no longer able access his Twitter feed via my primary Twitter feed, and this means I can no longer tweet at him or respond to him as me. More egregious, in 2017, then Presidential spokesperson Sean Spicer said that Trump's tweets amount to "official statements from the President." Therefore, I am also being denied access to the President's official statements because he is a thin-skinned, ignorant coward who cannot handle criticism of any kind. When you don't clap at his speech, he calls you a traitor, for example. In January of 2018, after Trump seemed to be goading North Korea into a nuclear clash via Twitter, an argument was made that Twitter bans users all the time for making similarly threatening and endangering remarks. If Twitter is concerned about the dissemination of the important information from world leaders and therefore exempts them from any possible ban, then Twitter should also be concerned about the hundreds and perhaps thousands of Americans who Trump has blocked, including me, who have also been denied this "important information." If you want to argue that world leaders cannot be banned from Twitter because the information they provide is too important to hide, then world leaders should be prevented from blocking citizens from this same important information. This would be a fair, logical, and sensible policy that would afford world leaders the benefits that Twitter believes is necessary while also providing some basic rights for the citizenry of the world as well. Why Twitter has not taken this step baffles me. Are they afraid of our vindictive, man-child President? Do they worry that he might abandon the Twitter platform for Snapchat? Or is the company run by hypocrites who don't give a damn about the dissemination of important information?